Welcome to the new blog site. PSU has gone to an upgraded version of Moveable Type. It will allow me to do more with the blog and gives it a much needed new look. The url has changed slightly to make it easier for people to find. Feel free to send me any comments or suggestions about how this blog can be improved. We invite you to submit a paper/abstract to The 7th International Conference on Education and Information Systems, Technologies and Applications: EISTA 2009 (http://www.2009iiisconferences.org/EISTA). It will take place in Orlando, Florida, USA, on July 10th � 13th, 2009. Submitted papers or extended abstracts will have three kinds of reviews: double-blind (by at least three reviewers), non-blind, and participative peer-to-peer reviews. Authors of accepted papers who registered in the conference can have access to the reviews made to their submission so they can accordingly improve the final version of their papers. Non-registered authors may not have access to the reviews of their respective submissions. Awards will be granted to the best paper of those presented at each session. From these session’s best papers, the best 10%-20% of the papers presented at the conference will be selected for their publication in Volume 7 of JSCI Journal (www.j-sci.com/Journal/SCI). Libraries of journal author’s organizations will receive complimentary subscriptions of at least one volume (6 issues). More details about the reviewing process, the acceptance policy, organizing invited sessions, and submission deadlines can be found at our web site. 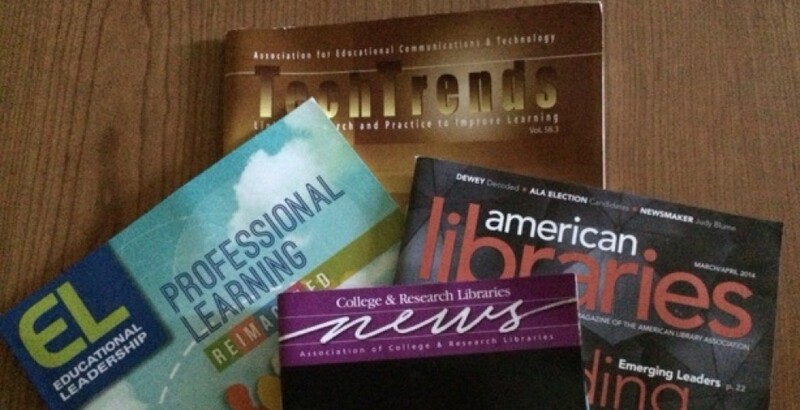 The Association of College & Research Libraries, with generous support from Thomson Reuters, makes an annual award of $1500 to support dissertation research in the field of academic librarianship. * Details are available online at http://www.ala.org/ala/acrl/acrlawards/doctoraldissertation.cfm and applications are being accepted through December 5, 2008. Are YOU the next Doctoral Dissertation Fellowship winner? * No attempt will be made to define academic librarianship, but the subject should be consistent with topics usually published in College & Research Libraries or key refereed library and information science research journals or presented at ACRL meetings. Publish your research papers, position papers, or practice abstracts, and book reviews in this international refereed journal. The International Journal of Information and Communication Technology Education publishes articles, papers, manuscripts, and book reviews promoting the advancement of teaching with technology at all levels of education encompassing all domains of learning. The primary mission of the IJICTE is to serve as a medium for introducing, collaborating, analyzing, synthesizing, and evaluating new and innovative contributions to the theory, practice, and research of technology education applicable to K-12 education, higher education, and corporate and proprietary education. Prospective authors are invited to submit abstracts of the highest quality not currently under review by another publication. The IJICTE journal would be pleased to receive original materials concerned with the theoretical underpinnings, successful application, and potential for advancing technology education within formal education, corporate training, higher education, professional development, and proprietary education. The IJICTE publishes contributions from all disciplines of information technology education. the articles for editorial content and academic consistency. The New Mexico LOEX Committee invites you to submit proposals to be considered for presentation at the 37th Annual LOEX Conference, April 30 – May 2, 2009 in Albuquerque, New Mexico. The conference theme, Blazing Trails: On the Path to Information Literacy, explores the diverse paths that librarians take to develop successful information literacy programs. – Luminarias: The Art and Practice of Teaching casts light on teaching strategies, curriculum design, learning styles, and student engagement. – Trail Guides: Leadership and Management covers topics such as managing a significant project or team, leading an initiative such as integrating information literacy into institutions of higher education, or establishing and fostering a professional development program. – Off the Beaten Path: Creativity and Exploration includes comprehensive planning or implementation of innovations or emerging trends in all aspects of information literacy and instruction. – Shortcuts: Lesson Plans To Go has the presenter share a proven lesson or unit plan, including processes and materials. Session participants should be able to go back to their respective institutions and readily implement the lesson plan. – From Covered Wagon to the Railroad: Technology in Education asks what are useful roles of instructional technology in the 21st century? This track focuses on building, utilizing, or sustaining the effective use of technology in education. – Round-up: Collaborative Efforts and Spaces examines how collaborations between people and programs can enhance information literacy and what types of spaces are best for collaboration and instruction. – Are we there yet? Assessment and Accountability focuses on evaluating teaching or instructional tools, peer evaluation, or assessing user needs, student learning, or information literacy initiatives. Two types of proposals will be accepted. Presentation: A 60-minute session that includes time for a 45-minute presentation and 10-15 minutes of question and answer. Most feature a successful program, practice or key issue related to instruction or information literacy. Presentations are intended for an audience typically of 50-70 people. Presenters should include in the proposal description the topic and an outline of the presentation. Interactive Workshop: A 60-minute session where the presenter facilitates a learning environment in which attendees develop or explore teaching and/or research techniques. Presenters are expected to facilitate a well-planned and interactive session. Workshops are intended for an audience typically of 30-60 people. Proposals should include a description of the topic and details on how the presenter will make this session a “hands-on” experience for attendees. In addition, there will be Poster sessions. Students currently enrolled in a Master’s program in library and information sciences along with librarians in resident or intern programs will be invited to propose poster sessions. Details about proposing poster sessions will be posted in a separate call for proposal. Proposals must be received by November 21, 2008. Proposals must be submitted through the online submission form. The primary contact on the proposal will be notified if the proposal has been accepted for presentation by Friday, January 16, 2009. The LILAC (Librarians’ Information Literacy Annual Conference) 2009 call for papers is now open. This year’s conference will be held at Cardiff University from the 30th March – 1st April 2009. We welcome submissions from practitioners and researchers in a variety of formats including: short and long papers, posters, workshops, demonstrations and symposiums. If you have any queries please do get in touch with me. We hope to see you at LILAC 2009 and look forward to receiving your proposal. its annual conference, held in conjunction with the Congress of the CFHSS/FCSH. territories and boundaries of exclusion reproduced (or diminished) within this space? realities and academic theory classes. between WS and Native Studies? should it try? Are there better structures to encourage and improve dialogue? independent activist organizations, and how are these being sustained or eroded? presentation, please include a brief write up on any necessary audiovisual, technical, logistical, or room size and location considerations. contributions of each member. All proposals will be anonymously reviewed. To join, please visit www.yorku.ca/cwsaacef. stated word limit will not be considered. Will be held prior to the IFLA conference in Milan mid-August 2009. The Call for Proposals and submission form are too long to copy here, and are not yet posted by the sponsoring section, Continuing Professional Development & Workplace Learning. I will be happy to send as attachments to anyone interested in seeing the details.